← I Have A New Addiction.. PINTEREST ! When I grew up in the 50’s & 60’s in Piedmont, AL, ( I call them the “Mayberry Black and White Days), it was in a small country town at the foothills of the Appalachian Mountains. I have a few good memories, and here is one. Pop had a brother, Uncle Rufus. He lived across town, which by miles was probably one from us. He was our “Doctor”… not a regular doctor, but the man my mother would call when we were sick to come to our home to pray over us and leave us a hankerchief with his oil that he used. He would always pray, give us the cloth with the blessed olive oil on it, and then draw us a picture of Popeye before he left. He was a sweet man. I always knew if we sneezed or started to cough, or one of us had the chicken pox or measles, expect a visit from Uncle Rufus and Popeye . His wife, Aunt Violet, was famous. Well, she was famous to us by Piedmont standards. She was known all over for her cooking and sewing. You see, Aunt Violet rarely used a pattern unless requested by her client. She just took your measurements, wrote them down, and called you in a day or so when your item was ready. She made wedding dresses, majorette outfits, uniforms, church dresses and I am not sure what else. I have even gone by there as a teenager and told her what I wanted that the other girls were buying in the stores. She would sketch it out and make it without a commercial pattern. Just her own. I do not know how she did it. 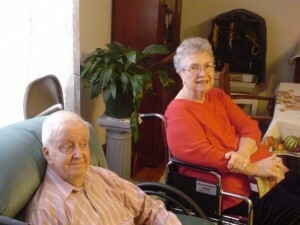 I loved going to their house on Saturday nights with Granny and Pop. It was nothing fancy … Just an average house like we had. It was just clean, warm, and inviting. I would go in and sit down on the couch in the living room/sewing room/reading room/tv room. Aunt Violet loved to read and above the doorway she had shelves with her books on them. I believe, if I am not mistaken, they were like Perry Mason mystery books and some romance books. Not like the ones we have today, but good old love stories and mysteries for that time. Being a young child it made an impression on me. If she was not sewing when you went in Uncle Rufus would have the TV on and she would have one of her paperbacks. I always will remember her going in the kitchen getting me a piece of pound cake to enjoy while she and Granny would talk. If the light was turned on at the sewing machine, you can be sure under the needle was a masterpiece, a” Violet Original”, and of course her tape measure was around her neck. She always was happy and laughing and very kind to me. There have been a lot of times Granny would call her and tell her she wanted to get her to make my Easter dress. She would tell Granny, “Ok. I will be glad to. Just bring however much material and whatever embellishment Chris wants on it.” We would go to the small fabric shop in our town down by the cotton mill and Granny would pick out my dress material. Back then we did not wear pants, and heaven forbid if we wore them to church! The material usually consisted of Dotted Swiss fabric and some type of floral flower type trim to go around the hem or collar. Usually I picked out daisies that were together and you had to cut them apart and sew them on by hand. We would take it over to Aunt Violet’s home. I would be wishing for a piece of cake while Aunt Violet was measuring me. I usually got my wish. Then, this is not a lie… She would not start on that dress until sometime late Saturday afternoon or night before Easter the next day and call us the next morning to come get the dress to wear to church. I swear she was a fabric Fairy! She worked miracles. I don’t guess she ever slept. Did not matter what time of the day, evening or night you went by there, most likely she was sewing. I saw her for the last time a few years ago when one of my relatives was having their 50th Anniversary party. Still smiling, but this time she was sick and had not been able to sew anymore. I know that was a sad time for Aunt Violet. A few years before that, just a few weeks after Gary and I got married, I got a letter from her. In it was a nice letter telling me how happy she was I married a nice man and “Here are two recipes that may come in handy someday.” One was her pound cake, which for the life of me I have hunted and I must have misplaced it. Then another, which is a wonderful cake recipe, her Deep Chocolate Cake. It was written in her handwriting and I am going to share it with you. ** Warning** it is one of those that you can’t eat but once a year! But oh it is so good! 6 small Hershey’s candy bars. 1 3/8 ounces each. Cream sugar and butter. Add one egg at a time. Add cooled chocolate mixture. Alternate milk and flour that has dry ingredients sifted in to it. Bake in a large tube pan that has been greased and floured. 300 degrees for 1 1/2 hours. Cool about 20 minutes before turning out into cake rack. Mix together and cover cake with the icing. Now, I don’t know about you, but I could eat the whole cake. I can’t cook it nor eat more than 1/2 of a slice, but for those that cook like that, here is you a wonderful recipe. Maybe one day Aunt Violet’s daughter Ginger will cook one and let me know in advance and I will drive 90 miles to get that one slice. Aunt Violet also cooked for the town. If you needed a cake or pie you could call her and tell her and she would tell you the price and you just go pick it up in a few hours when it was ready. She truly was a magical fairy … had to be! There is no way anyone could do what she did! Aunt Violet was a remarkable person, very talented. Aunt Violet, there is no dress on earth that compares to the thousands you turned out for everyone in our little “Mayberry Black and White”. I loved every one of mine. You were the Aunt Bea Taylor (Fitzpatrick) of Piedmont! You are still loved and missed and I have had a lot of clothes since I left that little town in 1972, but not one compares to yours! Oh, and she could play the mandolin! A lady of all trades..And truly a wonderful Christian woman. We love and miss her and Uncle Rufus. When you get to Heaven, and you are waiting there for your new robe and wings, just look on the label. I am willing to say it will read “A Violet Original.” If there is a sewing area there,she is the CEO and designer with her little tape measure around her neck, notebook and pencil on her machine, and not only will your name be written in the Lamb’s Book Of Life.. Aunt Violet will have your measurements written down in her little book that sits on her sewing machine. This entry was posted in 2012, Cooking With Sadie, Family Stories. Bookmark the permalink. I love chocolate, but, that is a LOT of chocolate in that cake. Sweet story. Cheryl´s last blog post ..Catching up! Progress! & Squishies! Cheryl that is why I can’t eat that cake but one slice.. IT IS GOOD THOUGH!!! Bertha Word, my aunt, would always buy clothes that didn’t fit quite right (she was a large women) Then she would say “Violet will fix it” And she was always beautifully dressed! Chris, do you remember those dresses little girls used to wear with the sash that tied in the back? Half the time when I went to pee the end of my sash would end up in the toilet! YES and the other half my sash went in….LOL Aunt Violet was something else.